In this Photoshop Basics tutorial, we'll learn how to create fun designs and interesting logos by combining text with custom shapes! First we'll learn how to convert the text itself into a shape. Then we'll learn how to add other shapes to it and even how to cut shapes out of letters! The design I'll be creating here is very simple, but you can use these same steps to design anything you can imagine, especially if you know how to make your own custom shapes in Photoshop! 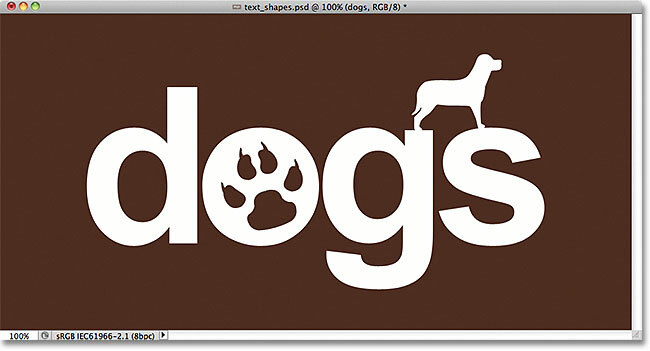 I'll be using Photoshop CS5 for this tutorial, but any recent version of Photoshop will work. Some text in front of a simple background. 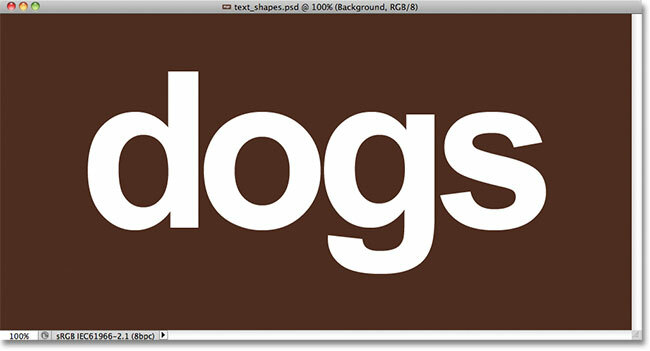 The text appears on a Type layer, one of several different types of layers in Photoshop. The text is now a shape that looks like text. It's also no longer editable. We're going to learn how to add other shapes to our text and how to subtract shapes from the text. Let's start by seeing how to subtract a shape, or in other words, how to cut a hole out of a letter with a shape! In a moment, I'm going to use one of Photoshop's custom shapes to replace the hole in the center of the letter "o" with something that looks more interesting. Click and hold on the Path Selection Tool, then choose the Direct Selection Tool from the menu. Make sure the shape's thumbnail is highlighted in the Layers panel. Click and drag around the area you want to delete. Selected anchor points appear as solid squares. Unselected ones appear as hollow outlines. Press Backspace (Win) / Delete (Mac) to delete the selected part of the shape. Click and hold on the Rectangle Tool, then select the Custom Shape Tool from the fly-out menu. Click on the Shape Layers icon to select it if its not already selected. Click on the shape preview thumbnail. If you want to load one of the other shape sets, click on the arrow icon. Selecting the Animals shape set from the Shape Picker's menu. Choose Append to add the new shapes in with the original ones. Click on a shape's thumbnail to select it. Photoshop gives us five different drawing modes to choose from, like "Add to shape" and "Subtract from shape". The problem with choosing drawing modes by clicking on these icons in the Options Bar is that each time you need to switch to a different mode, you have to drag your mouse up to the Options Bar and select it manually. Also, it's too easy to forget which one is selected, so you'll go to draw a new shape only to end up adding it to an existing shape because the "Add to shape" option is the one you used previously and you forgot to change it back. A better way to switch between drawing modes is with the much faster keyboard shortcuts, which allow us to switch between modes temporarily and always revert back to the default "Create new shape" mode as soon as we release the key! For example, to subtract a shape from an existing shape, rather than choosing the Subtract from shape option in the Options Bar, simply hold down your Alt (Win) / Option (Mac) key on your keyboard. You'll see a small minus sign ( - ) appear in the bottom right of your mouse cursor letting you know you've temporarily switched to the "Subtract from shape" mode (if you see the Eyedropper icon appear when you hold down your Alt (Win) / Option (Mac) key, it's because you don't have the shape's thumbnail selected in the Layers panel. Make sure it's selected before you continue). Hold down Alt (Win) / Option (Mac) and drag out the new shape inside the original one. Photoshop subtracts the new shape from the original when you release your mouse button. Choosing a new shape from the Shape Picker. 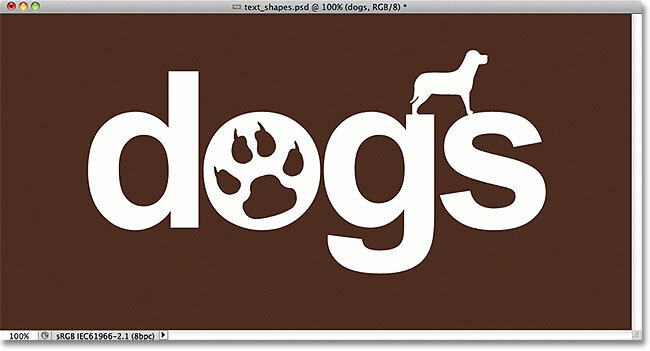 Hold Shift and drag out the shape to add it to the text. The new shape is added to the text shape. The text after adding and subtracting other shapes. Everything we've done has been to the text shape. Whichever tool you used previously will be the one appearing in the Tools panel. The other tool(s) will be hiding behind it. Select a shape by clicking on it with the Path Selection Tool. This bring up Photoshop's Free Transform Path box and handles around the shape. To resize the shape, simply drag any of the four corner handles. 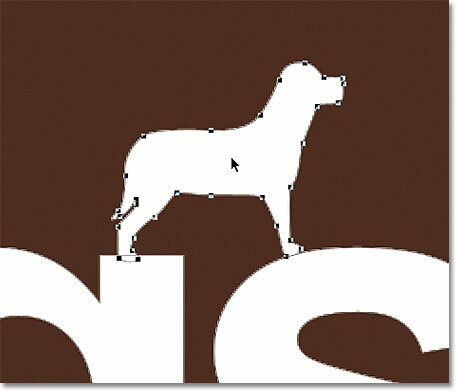 To keep the aspect ratio of the shape intact as you resize it, hold down your Shift key and you drag the handles. To move the shape, click anywhere inside the bounding box and drag it around with your mouse. You can also rotate the shape if needed by clicking anywhere outside the bounding box, then dragging with your mouse. 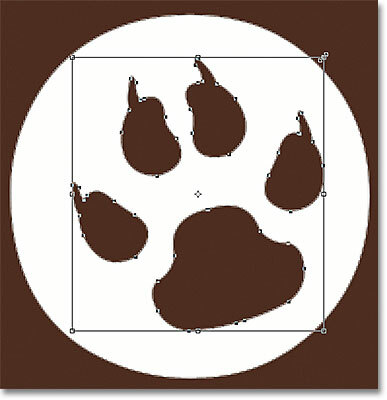 Use Free Transform Path to resize and move the shape as needed. Shapes being used to cut holes out of other shapes can be moved and resized just like any other shape. And there we have it! That's how to combine text with shapes in Photoshop! Check out our Photoshop Basics section for more great tutorials on working with shapes and type, plus layers, selections and other essential skills! Or, see below for more tutorials you may be interested in!